Event-triggered marketing services are a critical component to the success of any marketer looking for more focused sales efforts from their sales team. OnTarget has been delivering sales intelligence, and trigger event marketing services since 2005, and we have a depth and breadth of knowledge across a variety of industry verticals. 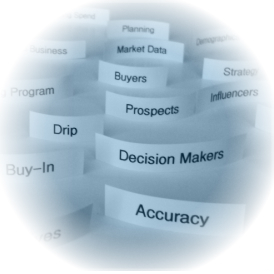 As you are aware, trigger events can both be at the macro level (vertical), and micro level (particular target company), and we are experts in following not only the vertical trends, but more importantly, the relevant developments at a particular target company – in short, we deliver accurate and timely Intelligence for Business®. From a macro economic standpoint, is the vertical in growth or decline? Have there been many acquisition, divestitures, mergers, acquisitions, etc.? What, if any, government regulations have been passed that will ultimately affect how business is conducted? What solutions may become obsolete, and what solutions may take on additional importance, and garner the mindshare of the top executives, given these macro changes? From a micro standpoint, what are the recent developments? Has there been an infusion of new capital or M&A Activity? Is there activity to suggest possible expiring contract sales? New hires or layoffs? Any divestitures of mergers of note? Such changes are critical in identifying the likelihood that a company may be interested in your particular offering, solution, product, etc? You need a trigger event monitoring company that can help you, as a marketer, succeed. OnTarget has the systems, processes, workflow, and personnel in place to make sure that all relevant triggers are covered, and the understanding with how these triggers are likely to impact your overall demand generation marketing environment. From monitoring executive changes to monitoring expiring contract sales, we can help your company with focused sales activity by monitoring sales triggers most relevant to your solution offering. Although such a system can not always find a contract service renewal sale, expiring contract sale, or guarantee closed business, it can and will help you focus your marketing efforts on deals “closest to the cash” through the use of trigger event selling and marketing. Trigger Event Monitoring across a variety of target verticals (approximately 30) using an Integrated Marketing approach. Data list build of key decision makers and executives while analyzing marketing data on corporate acquisitions, corporate mergers, corporate divestitures, and key executive changes. Rated as top external marketing campaign for calendar year, and dramatically increased sales pipeline.